Swiss brand Longines, with over 180 years of history richly interlaced with the equestrian world, has released a new collection of watches, inspired by the instruments of equine sports. Instantly recognisable by its winged hourglass logo and elegant designs, Saint-Imier based Longines continues its relationship with Australian equestrian events in 2015 as the Title Partner of the Longines Queen Elizabeth Stakes held on April 11th in Sydney, as well as the Official Timekeeper and Watch of Royal Randwick and the Australian Turf Club. Of course Longines continues its ongoing association with the Melbourne Cup Carnival as the Official Timekeeper. Internationally, one need only list a few eventing names to see the effort Longines puts into maintaining its relationship with equestrian activities; Royal Ascot, Kentucky Derby, Prix de Diane Longines at Chantilly Racecourse, the list goes on! 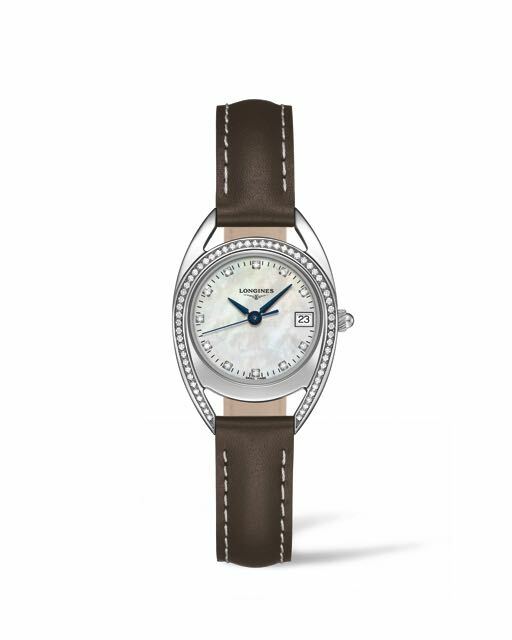 With such a pedigree, the Longines Equestrian Collection has been a long time coming and as Longines is renowned for their elegant pieces and ability to design for the female consumer, they have created a collection that fits perfectly into that mould. There are two case shapes in the collection, one symbolising the arches of racetracks and horseshoes (left), the other the stirrups (below). Both versions are on leather straps with white stitching, symbolic of the outfits of the rider, although I’m unsure why they haven’t carried the white stitching element across to the black dial stirrup piece. Both versions have three available sizes from 23mm to 34mm for the arch (30mm for the stirrup). The collection contains a Swiss Quartz movement, in keeping with the majority of the Longines Elegance line. 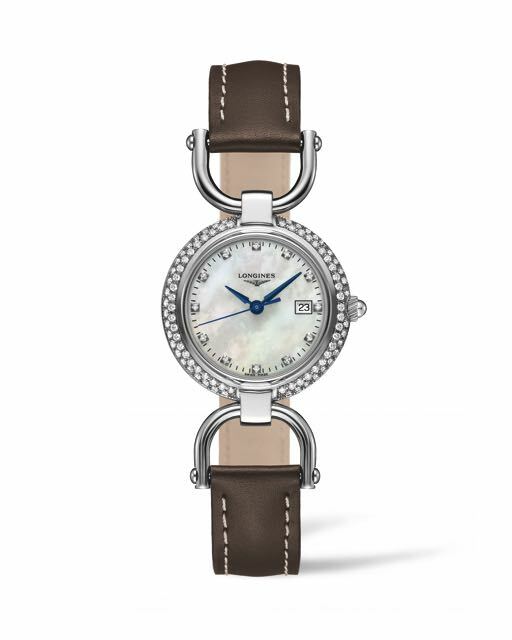 The mother of pearl dials have diamond indexes and include the blue steeled hands, a look carried over from the Prima Luna collection and some Dolce Vita models. Unfortunately, they haven’t carried across the roman numerals for the silver coloured flinqué dial which is a real shame as the roman numerals add a higher dimension of elegance and refined timekeeping. The stirrup version is not dissimilar in shape to the Hermés Fauberg or the Gucci Horsebit, although the ‘stirrups’ attaching the case to the strap are certainly more pronounced in the Longines version and similarities are to be expected when multiple brands have tight affiliations to the equestrian industry. I do prefer the arches model, the lines of the case flowing through to the lug allows a smoother fit to the wrist and the larger 34mm model is very appealing. 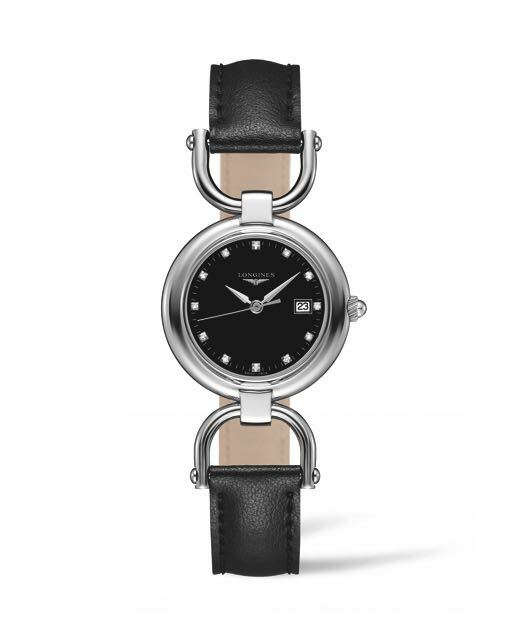 Overall, it’s nice to see Longines launch a new collection that is different from the norm and especially recognising the importance the brand places on its equestrian events. Longines timepieces are available through its Sydney boutique and select stockists throughout Australia and New Zealand.